Who will be the 2nd-half fantasy MVP? ASK THE EXPERTS appears weekly from training camp through the Super Bowl with answers to a new question being posted Thursday morning. How the guest experts responded when we asked them: Who will be fantasy MVP the second half of the season? At this point I think it’s hard not to say it won’t simply continue to be Patrick Mahomes and/or Todd Gurley as second-half fantasy MVP (for the first half, I think you can also make a case for Adam Thielen and James Conner, especially for where Conner was drafted). It’s hard to imagine a reason for any slow down to Todd Gurley so he’d be my choice. 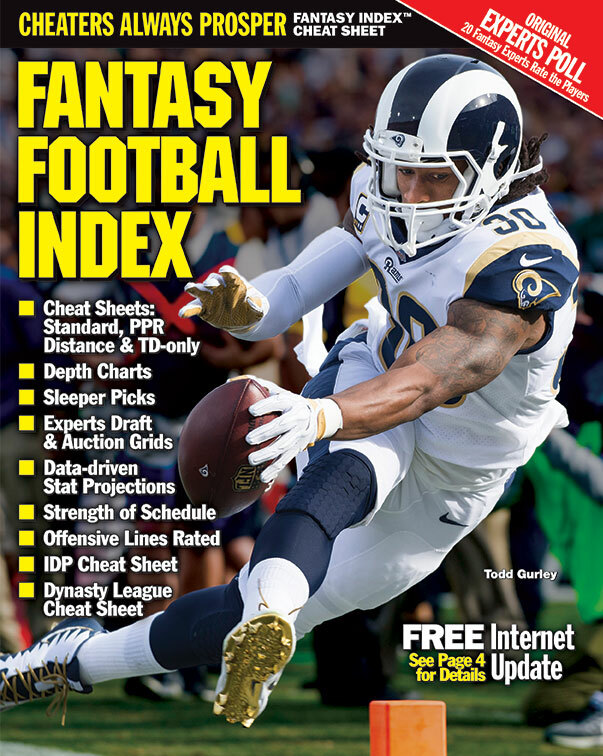 Gurley has been simply money every week, ranging between 23.7 to 36.5 in PPR fantasy points. The only concern might be if the Rams rest their starters in the final weeks of the season. Aside from those two I’ll give a shout-out to Ezekiel Elliott as a candidate. Elliott will remain a workhorse so you know you don’t have to worry there, and the Cowboys will likely be competing all the way through Week 17 in the tight NFC East. Dallas also just shook up their coaching staff with a new offensive line coach so maybe that will have impact along with the addition of Amari Cooper which should rise all tides some. Elliott and the Cowboys also have a very attractive schedule to close out the season. From Weeks 12-14 they play three straight at home, then to the dome at Indianapolis in Week 15 before back at home against Tampa Bay in Week 16. Elliott could definitely deliver fantasy titles here down the stretch. It’s going to be tough to outdo either Mahomes or Gurley after their outstanding performances so far. Contenders for MVP are going to be either Drew Brees or Cam Newton since both are on winning streaks, both have great schedules the rest of the way that shouldn’t include any bad weather venues. Brees could see a reduction from allowing the rushing offense take care of business which we just saw. Newton is a part of the Panthers rushing effort and is immune to those ups and downs. Newton should surprise. I don’t think either Gurley or Mahomes is slowing down. Gurley has 15 TDs at the halfway point of the season. Will they go after the single-season record (Tomlinson: 31 TDs)? Maybe. Similarly, Mahomes has 26 TDs at the halfway point. I think they’ll keep their foot on the gas, maybe helping Mahomes get up to 50 touchdowns. Comparing Patrick Mahomes to Todd Gurley as 1st half-MVP candidates is like asking which is better: barbequed ribs or fried chicken. I see no reason why they will not carry on their MVP battle for the rest of the season. In judging a potential MVP, though, my fundamental question is always what would the team be like without him? In this case, I believe that as great as Gurley is, the Rams could plug in another RB or RBBC and still be a dominant winner. Without Mahomes however, Kansas City would be lost offensively. Their backup QB is _________. Can anyone name him without looking it up? Sorry, but with the well-traveled Chad Henne playing behind center, Kansas City would be lost. James Conner. I would vote him first-half MVP and a great candidate for second-half MVP if Bell stays away. Even if Bell comes back and the Steelers take him back, Conner is in for a lot of touches to prove a point. Regardless he has saved many fantasy teams that were smart enough to handcuff him to LeVeon Bell and I predict he does more of the same for the rest of the season. I think it might be Aaron Rodgers. The Green Bay defense is really soft, and the team just doesn't have a running mindset. In Week 14, a playoff opener in many leagues, the Packers host the Falcons. On the other hand, Green Bay does have to play at Chicago (Week 15) and at Minnesota (Week 12), neither of which is ideal. So let's pivot to Cam Newton, who has an awesome late-season schedule. From Weeks 13-16, he plays at Cleveland and Tampa Bay and home against the Saints and Falcons. Got a feeling Newton and Christian McCaffrey are going to be on a lot of champions.